Last night we spotted an Osprey behind our house. It perched in a tree for an hour and then flew away. Tonight the Osprey returned to the same tree and we watched it catch a fish from the pond behind our house. It again perched in the same tree and ate its catch. A beautiful bird to watch. I have never seen one before! 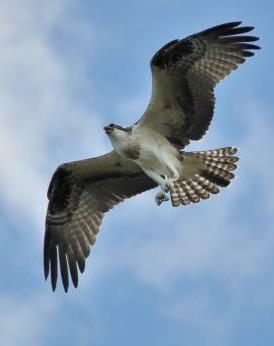 Thank you for letting us know about your Osprey sighting - how wonderful, that must have been so beautiful to see! I saw one too, it was huge. It was near my building, near a School.